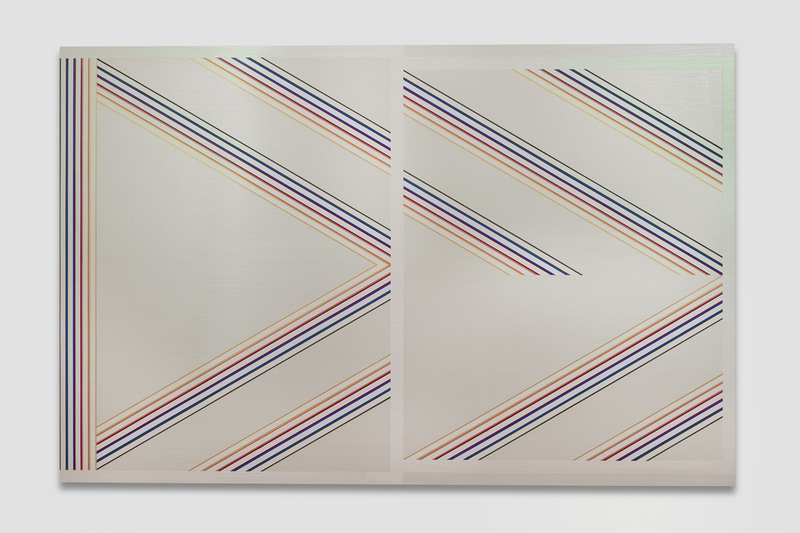 Ann Pibal, RBWCMX, 2017, acrylic on aluminum panel, 41 x 63". Ann Pibal’s paintings have all the geometric intensity of Piet Mondrian’s, and yet they feel more interwoven with life than the Dutch modernist’s creations. Like Mondrian, she sets certain rules to guide her patterns. See RBWCMX, 2017, for instanceone of the three acrylic-on-aluminum panel works in her exhibition here. Its chevrons, made up of colorful and seemingly uniform lines, are actually variegated, ever so slightly. Pibal is always willing to lay waste to her systems when necessary. Her electric, razor-sharp lines are too vivacious to illustrate anything except the experience of livingactivelywithin the world, within a body. It makes sense that one model for the artist’s practice would be surfing. In addition to the paintings, she presents a series of works on paper, “Surf Type,” 2018. Each piece features a page taken out of a surfing magazine that has been laser-cut with patterns. But they can’t compare to CBLT, 2018, a painting of what might be an epiphanic moment. Its surface of deep blueswith a subtle arrangement of six skinny red stripesis like a wall of water, a wave coming in and subsuming your field of vision before it crashes. Yet it is of modest sizeno sententious abstractionist’s spirituality here, just meditative, beach-bum loveliness. Surfing admits no figure/ground opposition: Foreground and background are irrelevant when massive waves blot out the horizon or the figures that try riding them. Like the sun-bleached Adonises of the surf rags (experts on the oceans’ capricious moods), Pibal is attuned to the subtlest shifts in perspective, angle, and depth of field. She is a master surfer of the visual, perceptually hanging ten.